Hillary Clinton Supplied Chemical Weapons to Syria-Fiction! - Truth or Fiction? Hillary Clinton Supplied Chemical Weapons to Syria-Fiction! Hillary Clinton Supplied Chemical Weapons to Syria-Reported as Fiction! Hillary Clinton supplied chemical weapons to Syria during her time as secretary of state, and those chemical weapons were either used by Syrian President Bashar al-Assad to attack his own people, or by an independent group to make it look like Assad had carried out a chemical weapons attack. Syria’s chemical weapons program extends as far back as the 1980s, and there’s no indication that Hillary Clinton supplied Syria with Sarin or chemical weapons precursors at any time. Hersh didn’t elaborate as to whether the “arms” he referred to encompassed the chemical precursors for creating sarin gas, which Libya stockpiled. However, multiple independent reports have independently confirmed that Gaddafi of Libya did, indeed, possess such stockpiles. The story pulled a classic clickbait trick: making a bold claim in a headline and failing to back it up in the story with proof. 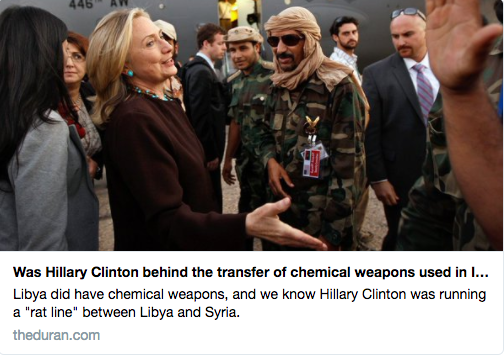 Still, the story has been widely circulated and cited in reports claiming that Hillary Clinton did, in fact, supply chemical weapons to Syria ever since. The United States did push weapons to Syrian rebels by way of the CIA, however, it’s been reported that that didn’t happen until September 2013, and Clinton had resigned from the position in February 2013. “There is no doubt amongst the UK intelligence community that the Syrian regime possesses vast stockpiles” of chemical weapon, according to a British Parliamentary report published in July 2013.15 Israel Defense Forces Deputy Chief of Staff Major-General Ya’ir Nave described Syria’s chemical weapons arsenal as “the largest in the world” during a June 2012 interview. Damascus possesses mustard blister agent, sarin nerve agent, and VX nerve agent, according to official U.S. assessments.. According to a French intelligence report published on September 2, 2013, Syria has more than 1,000 metric tons of chemical warfare agents and precursor chemicals.18 This stockpile includes several hundred metric tons of sarin, which represents the bulk of Syria’s chemical weapons stockpile. Syria also has several hundred metric tons of mustard agent in ready-to-use form and several tens of metric tons of VX. The sarin and VX are, in part, stored in binary form (see below for a description of binary chemical munitions). Syria is developing both another blister agent (nitrogen-based mustard) and a nerve agent more toxic than sarin. The country’s chemical weapons and related facilities appear to be distributed throughout the country. U.S. Defense Department Press Secretary George Little told reporters on July 24, 2012, that Syria has “a really distributed network of [chemical weapons] stockpiles.” Similarly, Director of National Intelligence James Clapper told the Senate Armed Services Committee on February 16, 2012, that Damascus has “an extensive network” of chemical weapons installations. Indeed, Syria received precursor chemicals from the West until well into the last decade. Last week, the German government acknowledged that between 2002 and 2006, it had approved the export to Syria of more than 100 tons of so-called dual-use chemicals. Among the substances were hydrogen fluoride, which can be used to make Teflon, and also sarin. The exports were allowed under the condition that Syria would only use them for civilian purposes. The British government also recently acknowledged exports of dual-use chemicals to Syria. Both the British and German governments said there’s no evidence the chemicals were used to make weapons. So, Syria’s chemical weapons program has been well documented going all the way back to the early 1980s when the Soviet Union helped to establish it. There’s been no indication during that time, however, that the U.S. or Hilary Clinton supplied Syria with chemical weapons or chemical weapons precursors. The latest version of those rumors resurfaced in April 2017 after a chemical weapons attack prompted President Donald Trump to authorize a missile strike on an air field that was reportedly used to carryout the chemical attack. A fringe website called The Durant published an article under the headline, “Was Hillary Clinton behind the transfer of chemical weapons used in Idlib, Syria?” that used the inaccurate Inquisitr story quoting Seymour Hersh to make its argument. The story was widely picked up and reported, however, it doesn’t provide any direct evidence linking Hillary Clinton to Syria’s chemical weapons. And The Durant’s disclaimer states that it does not fact-check or regulate reader submissions, and that “any information therein are provided without warranty of any kind, including the implied warranties of merchantability, fitness for use of a particular purpose, accuracy, or non-infringement.” In short, it’s not a credible source of information. In the end, reports that Hillary Clinton provided chemical weapons to Syria are fiction. False claims that Hillary Clinton supplied chemical weapons to Syria have been circulating on social media. Malia Obama Expelled From Harvard for Smoking Marijuana-Fiction!